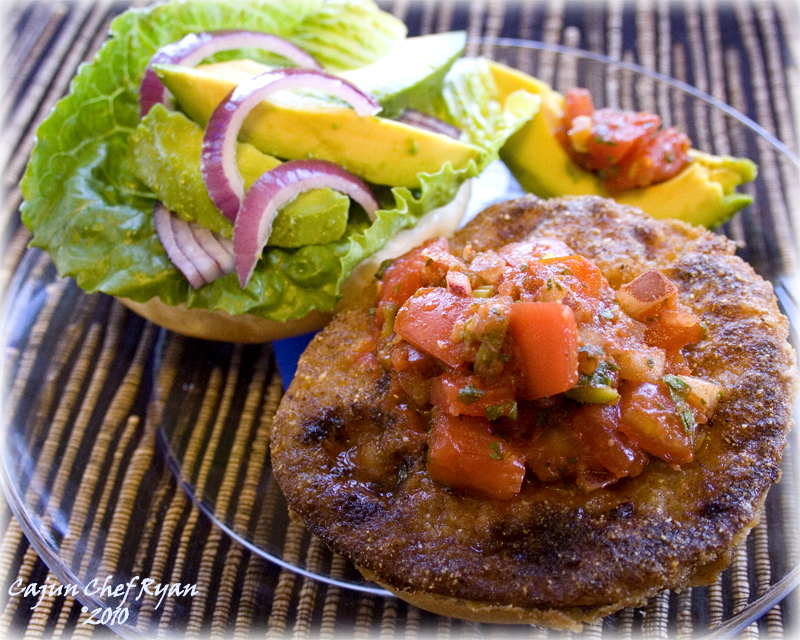 Fried Green Tomato Sandwich with Avocado slices and Fresh Salsa. We happened upon some fresh green tomatoes several weeks ago, and they were such a large size that we decided to whip a few fried batches, and they were some good eating. In fact, alone they were great with just a touch of Dijon mustard or Remoulade sauce. The variations for utilizing these southern favorites are endless; in fact memories of the Fried Green Tomato and Crawfish Remoulade appetizer at Muriel’s Restaurant in New Orleans creep into my reflection now. This sandwich is the result of having these ingredients on hand; it was not a planned meal, just something thrown together with what we had in the pantry and refrigerator. They say necessity is the mother of invention, and we sure do like this creation! We hope you will too! 1. Slice the green tomato into ¼” pieces, or at least four even slices, and set aside. 2. In a large shallow container, combine the beaten egg, milk, Worcestershire sauce, and Crystal hot sauce making the egg wash, and set aside. 3. Combine the corn meal and corn flour in another large shallow container and season with ½ teaspoon of sea salt and ½ teaspoon of the white pepper. In a third large shallow container add the all purpose flour and combine with the remaining ½ teaspoon of sea salt and ½ teaspoon of white pepper. The breading station is now ready: flour, egg wash, corn flour/meal mix. 4. Cut each avocado in half, and then remove the core and peel the two avocado halves, and then cut each half into four even slices, or eight slices per avocado. You should end up with sixteen slices total; these will be portioned out four slices per sandwich. Have the buns ready, the green leaf lettuce cleaned and portioned and the red onion rings cut and ready. 5. Heat the oil in a large sauté pan. While the oil is heating in the pan take one tomato slice and dredge it in the all-purpose flour getting a light coating, then dip the tomato slice into the egg wash for an even coating, then drip any excess egg wash and then dredge the tomato slice into the corn meal/flour mixture. Then carefully and without removing any of the coating, place the tomato slice into the hot oil. Continue for all four slices, and sauté until browned on both sides, or about 4 to 5 minutes per side. 6. While the tomato slices are sautéing set up the four sandwiches with the buns, lettuce leaves, avocado slices, and red onion slices. 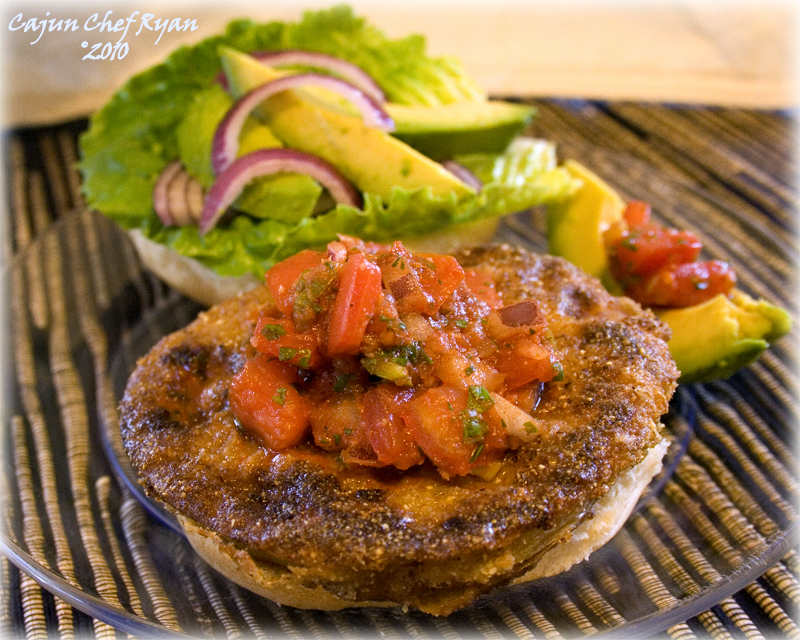 To Serve: When the fried green tomatoes are done, place one on top of the bottom bun and then add a dollop (2 tablespoons) of the fresh salsa over the fried tomato. Optional: Extra avocado and salsa can be served on the side. My mouth is watering so much, I love it! There is nothing I love more than fried green tomatoes! Love me some fried green ‘maters!! Looks and sounds wonderful Chef. I don’t think a sandwich gets more Americana than that! this one leaves me speechless absolutely mouth watering and perfect! bravo! Wow, the response to this one is flying like hotcakes! Really appreciate your comments and support! That looks utterly amazing! Saving this recipe. Now I’m just wishing I’d have kept some of those green tomatoes before we ripped the plants out of the garden. This looks delicious! I don’t know of nuttin’ better – like the remoulade dressing by far (maybe a little shrimp too) on these wonderful sandwiches… now you just make me want to go out and find some green tomatoes…. I have so many green tomatoes, and was thinking of making my spicy green tomato soup again, but now I am thinking I will do these sandwiches! Oh my, just wish I had some green ‘maters now! I’m on a quest to find some…… you would think that here is Wa. state that would be all we have!! Love your site by the way! A terrific fried green tomato sandwich! I love the addition of avocado! Wow, I’ve never had a fried green tomato and never really understood what it would be like but I am loving how this sandwich looks! What a wonderful sadwich! I don’t think I’ve ever tried something like that. Very creative! Is there anything better than fried green tomatoes? That sandwich looks amazing! Don’t frown at what I’m about to tell you, been down here since 1984 and I never ate fried green tomatoes! OM Gosh I so want one of the sandwiches.